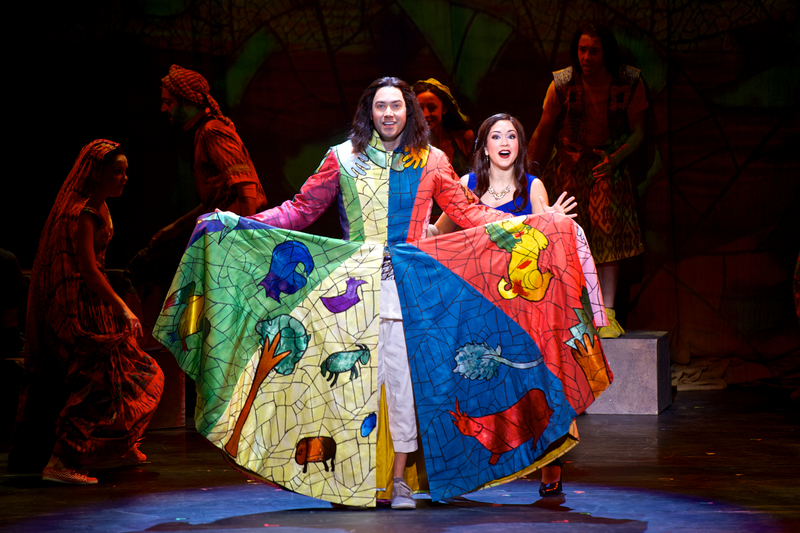 Joseph and the Amazing Technicolor Dreamcoat is an intriguing show, simply in terms of how versatile it is. It’s one of those shows that can be done on almost any scale or budget and still work. It’s not the deepest or most profound of shows. It’s really just a lot of fun, but what has become most interesting to me is the range of ways that a theatre company can produce this show. It can be big and flashy or more toned-down. Its look can change drastically depending on the production values and directors’ vision. It’s a show I’ve seen several times now, but I think this latest version from STAGES St. Louis is my favorite yet because of the cohesiveness of design, the sheer personality and energy of the cast, and the emphasis on a more human scale for this story rather than over-the-top flashiness, although it’s certainly a great looking production as well. The story of this show is fairly straightforward–it’s a retelling of the Bible story of Joseph (Jeff Sears), son of Jacob (Steve Isom), and of Joseph’s journey from shepherd’s son to essentially prime minister of Egypt. It follows Joseph from his early days tending sheep with his eleven brothers, and boasting of his dreams that predict that he will someday rule over the rest of his family. The story is presented by the Narrator (Kirsten Scott), who interacts with the characters at various times in the process of telling the story. As the story unfolds, a variety of different song styles is employed in whimsical fashion, from the country-western “One More Angel in Heaven” to the 1920’s styled “Potiphar” as Joseph, sold into slavery by his brothers, serves in the house of Potiphar (Brent Michael DiRoma) and is tempted and accused by Mrs. Potiphar (Molly Tynes), and then sent to jail. 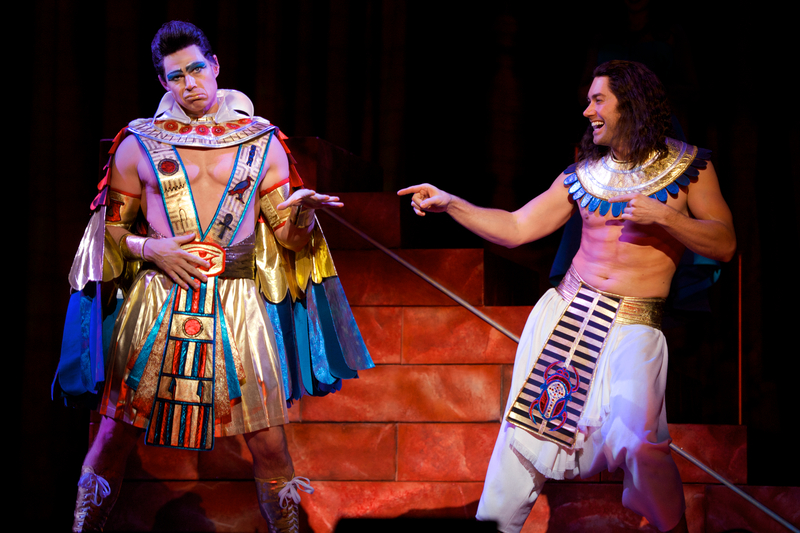 Joseph’s skill at interpreting dreams eventually brings him to the attention of Pharoah, who is–as in all productions of this show–presented as an Elvis-like figure (also played by DiRoma). It’s a fun show that blends the Bible story with various modern elements and and the variety of musical styles that also includes pop and rock influences. While I’ve seen bigger and flashier productions of this show, I’m especially impressed by this production’s emphasis more on character and a stylish but not cartoonish look to the production. It’s a very human Joseph, with a strong cast led by the excellent Sears as a Joseph whose emotional journey is given more resonance here than in some other productions I’ve seen, bringing depth to songs like “Close Every Door” and “Any Dream Will Do”. Scott is also superb as the Narrator–a role I’ve generally considered to be the best part in the show–and her vocal range is impressive on numbers like the “Prologue”, “Poor, Poor Joseph”, and “Pharaoh Story”. Scott brings a good deal of humor to the role of the Narrator as well, and her rapport with Sears as Joseph is a highlight. In fact, this is the first production I’ve seen in which there seems to be a hint of attraction between Joseph and the Narrator. There are also memorable performances from Isom as the proud and then sad patriarch, Jacob, by Tynes as the would-be seductress Mrs. Potiphar, and by all of the actors playing the brothers, and particularly Brad Frenette as Levi, Jeremiah Ginn as Reuben, Jason Eno as Judah, and Kyle Ivey as Benjamin. DiRoma is also a stand-out in two roles, as the rich but lonely Potiphar and especially as Pharaoh, where he exudes a lot of charm and comes across as more of the “young Elvis” as opposed to the older “Las Vegas Elvis”, even though he does get to wear the glittery, sequined jumpsuit. There’s also a strong ensemble to back up the leading performers, displaying a lot of vocal and physical energy on various production numbers that have been dynamically choreographed by director/choreographer Stephen Bourneuf. Visually, the show is colorful and whimsical without being overly flashy or cartoonish. It’s a great look for this show, in keeping with the overall tone of this production. James Wolk’s versatile set frames the action well, and Brad Musgrove’s costumes are vivid, detailed, and fun. The excellent lighting effects by Sean M. Savoie also adjusts well to the various scene and tone changes throughout the production. This is a fun show, and the cast and creative team obviously enjoy presenting it. From the starry opening to the bright, energetic “Megamix” conclusion, this is a Joseph with heart and humanity. It’s an excellent, highly entertaining production, and a great start to STAGES’ 2017 season. Joseph and the Amazing Technicolor Dreamcoat presented by STAGES St. Louis at Robert G. Reim Theatre in Kirkwood, Missouri on June 1, 2017. Joseph and the Amazing Technicolor Dreamcoat has been produced many times over the years, and in many countries around the world. It may seem like the show has been done so often that it would be a challenge to come up with a version that’s both entertaining and vibrant without seeming at least somewhat stale. Now, the latest national tour has taken up that challenge and, for the most part, succeeded. Starring a pair of former American Idol contestants, this production manages to overcome a few technical missteps and present an incarnation of the show that’s engaging and can be a lot of fun. The concept of this play is simple–it’s the Biblical story of Joseph (Ace Young) told in a pastiche format with a blend of different musical styles and concepts, with a Narrator (Diana DeGarmo) telling the story and sometimes interacting with the characters along the way. As Joseph undergoes his journey from entitled favored son to forced slavery in Egypt and finally to a place of prominence in the Egyptian government and reconciliation with his family, his adventures are portrayed mostly with humor, dance. spectacle, and a little bit of drama. The cast of characters is familiar, with the figures from the Bible fleshed out as more stylistic archetypes, most notably with Pharaoh (Ryan Williams), who is cast as an attention-loving Elvis impersonator. This show has been told many different ways over the years, although it seems the prevailing style for the past two decades has been based on the 1991 London Palladium revival, with its flashy sets, children’s chorus, expanded role for Joseph and the added “Megamix” song-and-dance medley at the end. The previous live versions I’ve seen have followed that mold, for the most part. Refreshingly, this latest tour gets away from that format, with a structure and song order more in keeping with the 1982 Original Broadway production. This version has an all-adult ensemble, Potiphar (William Thomas Evans) sings lead on his song, and Joseph’s notable song “Any Dream Will Do” doesn’t appear until late in the show, as it had been before the 1991 revival set the new standard. Although the Megamix is still added on to the end, it’s interesting to see the show performed with the older structure, which puts more emphasis on the narrator and the ensemble than on Joseph himself. The ensemble here is a good one, led by husband-and-wife American Idol alums Young and DeGarmo. The role of Joseph is somewhat slight and really just requires a reasonably good singer with a degree of physical fitness, and Young more than fits that bill. His voice is pleasant but not as powerful as other Josephs I’ve seen, and he plays the role with a somewhat distracting slouch, although he brings a wide-eyed, almost geeky quality to Joseph that is ultimately appealing. DeGarmo as the Narrator displays a lot of energy, stage presence and strong vocal ability, especially in her lower range and on big belty numbers like “Paraoh’s Story”. She tends to sound squeaky on some of the higher notes, but that may not be entirely her fault, as the sound quality isn’t great and lends something of a muddled quality to a lot of the vocals. DeGarmo interacts well with the ensemble and she has great onstage chemistry with Young, especially in their duet of “Any Dream Will Do” late in the show. There’s also an excellent ensemble here, with Williams hamming it up winningly on “Poor, Poor Pharaoh/Song of the King”. Several of the brothers shine in various moments of the show as well, such as Brian Golub (Reuben) in “One More Angel In Heaven”, Paul Castree (Simeon) in “Those Canaan Days” and Will Mann (Judah) in “Benjamin Calypso”. “Those Canaan Days” in particular is a treat, with excellent performances all around and some fun choreography involving juggling plates. Stylistically, the set (designed by Beowulf Borritt) is simple and clever, with a few movable set pieces, a prominent staircase and curtains framing the scenes and serving as a canvas for the excellent projections (designed by Daniel Brodie). The projections range from the abstract (various colorful shapes and patterns) to the concrete (such as a map of Egypt), and are cleverly used to set the mood and transition between scenes. There’s even one notable moment in which ocean scenes are projected on the backs of ensemble members, clad in flowing white robes. Director Andy Blankenbuehler’s staging and choreography is snappy and energetic, as well, with some fun stylistic callbacks to other musicals such as West Side Story (“Poor, Poor Joseph”) and Oklahoma! (“One More Angel in Heaven”), and fun elements such as the aforementioned dish-juggling sequence. The quality of the sound (designed by John Shivers and David Patridge), is cluttered and muddy, however, and the lighting (designed by Howell Binkley) is often too dark, and these flaws can be distracting but for the most part, don’t detract too much from the overall enjoyable nature of the show. This isn’t the first production of Joseph… I’ve seen and, as popular as it is, I’m sure it won’t be the last. Still, this latest tour has managed to make an impression and provide for an enjoyable evening of lighthearted entertainment. With two appealing leads and a strong ensemble, this production stands out as an enjoyable evening and a memorable retelling of this oft-told story. Go, Go, Go, Joseph (to St. Louis)! I almost skipped this production of Joseph. The Muny just did a production of this show five years ago and I was planning on sitting this week out because I thought I wouldn’t need to see it again so soon. I was wrong. I’m glad I caught a report on the local news talking about the “twist” of this production, because it made me curious to see it, and I’m very happy that I did. With this production, the latest in the Muny’s so-far extremely impressive 94th season, veteran Muny performer Lara Teeter takes the reins as director and choreographer and, along with a strong cast and crew, presents a show that is wildly entertaining, extremely clever and uniquely St. Louis. As usual, this is the Biblical story of Joseph, son of Jacob, with a twist—a pastiche of different musical styles melded together to tell the story. What is not usual, though, is that this production is set in a strange amalgam of the ancient Middle East and Egypt, and modern-day St. Louis. The show starts with a collection of people wandering aimlessly on stage as, one by one, a few recount how they have “lost their dream”. Then the Narrator (Mamie Parris) appears to tell the story of Joseph (Justin Guarini), who enters wearing a Cardinals jersey, singing one of the show’s most well-known songs “Any Dream Will Do”. From there, we are taken back to Bible times, sort of. Everything has a St. Louis flavor and oddly enough, it works. Jacob (Gary Glasgow) and his sons run a Schnucks-like supermarket (“Jacob and Sons”), go tailgating at Busch Stadium (“One More Angel In Heaven”) and later, when their fortune changes, are relegated to hawking frozen custard concretes at Ted Drewe’s (“Those Canaan Days”). Joseph is sold by his brothers into slavery in Egypt, and goes to work for Potiphar (also Glasgow), who is an obvious Donald Trump-like character whose business empire is based in Downtown St. Louis. Later Joseph meets the Pharaoh (Austin Miller), who is an Elvis-like figure as is usual in this show, but this time he is backed by an ensemble consisting of golden cat-people and 1950’s-styled teenage groupies. The settings are hilariously random and specific at the same time, and St. Louisans in the audience are bound to recognize a lot of the references. It’s also amazing that most of the change of setting is achieved by the sets, costumes and performances as opposed to changes in the script. As far as I can tell, aside from the little addition to the prologue, the most drastic change to the show as written is an adaptation in the arrangement of one song– the usually titled “Benjamin Calypso” toward the end of the show has been turned into a gospel song, incorporating the full cast in a rousing, energetic production number. I’ve never heard of this being done before but in the context of this production, it works. There are also some fun pop-culture references thrown into the “Megamix” at the end. What is great about this production is that, while this very different approach could easily seem distracting or pretentious, it all goes together surprisingly well. This is just the right kind of show to adapt in this manner, in that it’s not a deeply serious show to begin with, and it seems to work best when everyone involved just has fun with it. All the elements of the show work together seamlessly. The set design is simple but effective—it’s basically just a bridge, with a few movable booths and platforms and familiar St. Louis scenes posted on the scenery wall in the background. The costumes are also simple with a lot of bright colors and some St. Louis specific outfits like the Ted Drewe’s uniforms and Cardinals jersey. The choreography is well-executed and energetic, reflecting the various styles of the songs. One of the best examples of the St. Louis specific staging is in the Ted Drewe’s sequence in “Those Canaan Days”, in which the booths are arranged into a reasonable suggestion of the custard stand, and the choreography even incorporates the signature “turning the concrete upside down” gesture in a way that is hilariously appropriate and adds to the humor of the song without seeming the least bit forced. Aside from the setting, the best thing about this production is its cast. Parris as the Narrator has a strong voice (occasionally reminiscent of original Broadway Narrator Laurie Beechman) and good stage presence, and Guarini, who was a pleasant surprise as Billy Flynn in the Muny’s Chicago a few weeks ago, is excellent again as Joseph. He projects just the right air of charm and cockiness at the beginning of the show, and convincingly matures into the wise leader by the end, and his voice is very strong in songs like “Any Dream Will Do” and the moving “Close Every Door.” Miller is obviously having a lot of fun as Pharaoh, and he shows a great rapport with both the cast and the audience. His part is relatively small, but he makes the most of it, and the scene in which he describes his dreams to Joseph (“Poor Poor Pharaoh/ Song of the King”) is a real highlight. Maurice Murphy as Joseph’s brother Judah leads the “Benjamin Gospel” number with a strong, clear voice and infectious enthusiasm as well, and Glasgow plays his dual roles of Jacob and Potiphar convincingly. All of the the brothers work very well together and their group numbers are a treat as well. The bottom line here is that this production is, simply put, a whole lot of fun. It’s goofy, it’s clever, and it’s so well put together that the company makes it appear as if this is the way the show was always supposed to be done. It’s not a deep or overly serious show, and there is not one bit of pretension. The way this production incorporates its setting is ingenious and a remarkable success. It’s a production with lots of humor, and to borrow a lyric from another show (Damn Yankees), “miles and miles and miles of heart”. 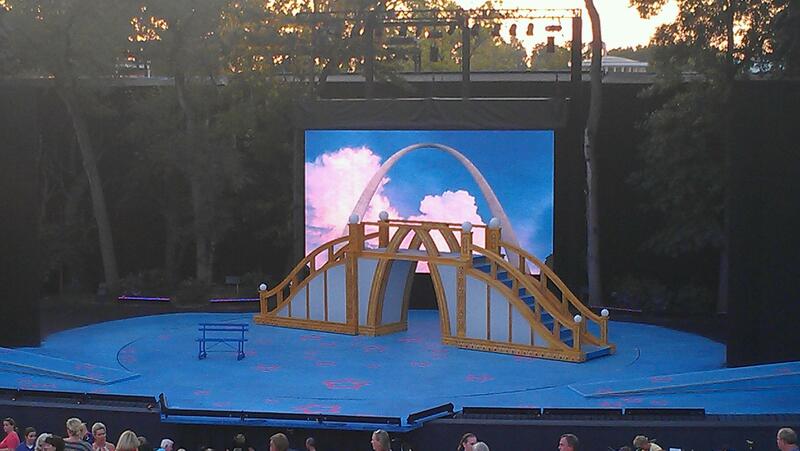 It’s a great way to celebrate the time-honored St. Louis tradition of attending a show at the Muny. I was very pleasantly surprised by this production, and after this season is done, this is one that will definitely stand out in my memory as an ideal example of how some things that might not work anywhere else can work incredibly well at the Muny. It’s a unique venue, and this was a fittingly unique and surprisingly successful production.